In the context of the Associated International Laboratory LIA CNPA, a collaborative study between the groups of Dr. Reiko Oda and Dr. Thierry Buffeteau in Bordeaux (laboratories CBMN and ISM) and the group of Professor Ihara in Kumamoto (Japan) revealed for the first time molecular chirality in amorphous silica. Synthesis of chiral inorganic or hybrid nanomaterials through sol-gel transcription of chiral organic templates has attracted a great deal of interest since more than a decade. However, the chiral nature of these inorganic matrices has never been directly observed. 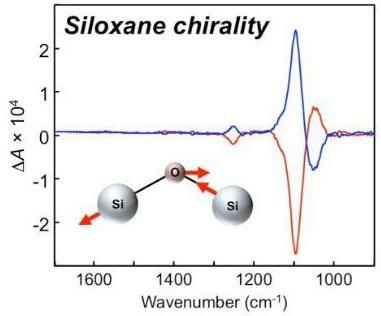 For the first time, we report a direct evaluation of chirality on non-crystalline silica chiral nanoribbons by vibrational circular dichroism (VCD) measurements. Strong Cotton effect around 1150–1000 cm-1, from Si-O-Si asymmetric stretching vibration was observed. Surprisingly, calcination of these hybrid nanoribbons doubled the intensity of Cotton effects. 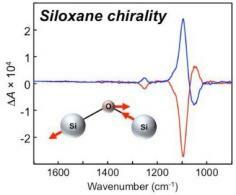 On the basis of TEM observations, IR, VCD, NMR, and Raman spectroscopies, we demonstrate that the silica chirality originates from twisted siloxane network composed of chiral atomic orientation. These findings clearly prove the presence of chiral organization of amorphous silica network, making them very promising chiral platforms for chiral recognition, optical applications or asymmetric catalysis.